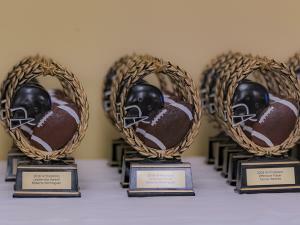 Thank you to everyone who joined us at our 5th Annual Predators Awards Banquet. It was great to see everyone again and celebrate the accomplishments of all our teams! The list of award recipients is below along with a selection of pictures. Thanks to 519 Sports Online and Censational Photography for capturing our event! We want to wish all the best to our athletes playing football this Fall whether it be in Fall Preds, High School or the OUA . Hope you have a standout season! We are extremely proud to have awarded 6 scholarships to our graduating seniors. We believe it is important to recognize and support our athletes who not only play football but are great community leaders, dedicated students and citizens. What makes the scholarships even more special is that three of them are named in the memory of former Predators who lost their lives too young in tragic circumstances. We would like to wish all our graduating seniors best of luck in your future enedeavours. We will miss you all!